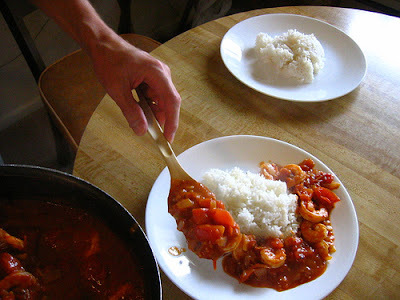 This shrimp dish is my very favorite recipe from my favorite Middle Eastern Cookbook. This rich, red sauce combines cumin, cinnamon and lemon juice into something so exotic tasting that it's hard to believe I made it in a suburban New Jersey kitchen! Better still, this dish is easy to make, passing the five easy questions test with flying colors. 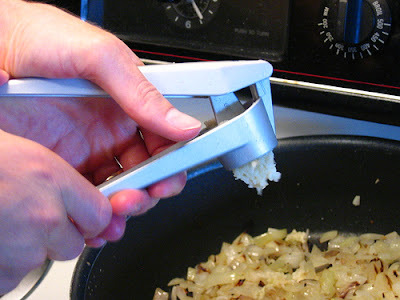 1) Saute the onions on medium-high heat until they begin to brown, about 5-6 minutes. Turn down the heat to medium and then add the garlic. 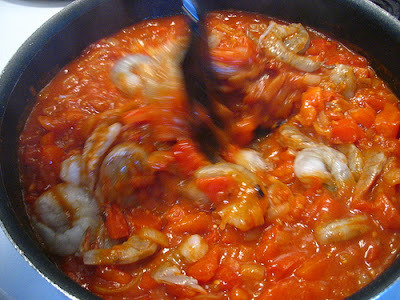 2) Saute the garlic/onion mix for 1-2 minutes, then add the chopped tomatoes. Then add the tomato paste, cumin, cinnamon, black pepper and water. 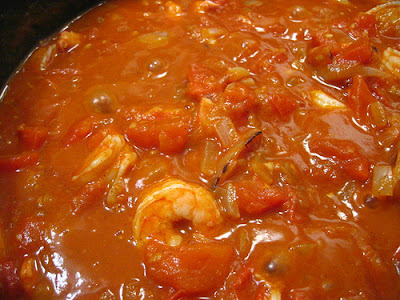 3) Bring to a low boil, then simmer the sauce for 15 minutes on medium-low heat, stirring occasionally. Don't let the sauce stick to the bottom of the pan. 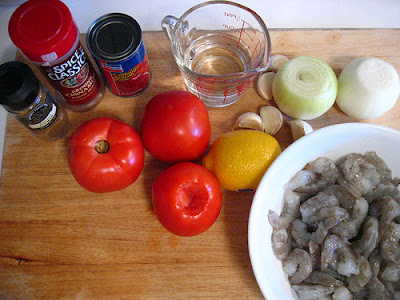 4) Add the shrimp, then the lemon juice, and stir well. 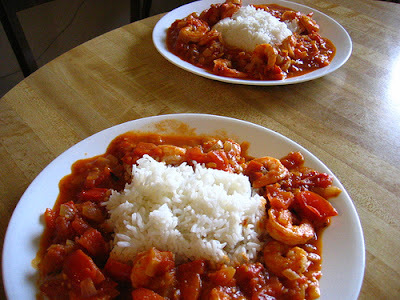 5) Cook for another 5-7 minutes, until shrimp are pink (maybe 1-2 minutes more if you're using large shrimp). Please, whatever you do, don't overcook the shrimp--it is a borderline crime to serve your guests tough, overcooked shrimp! Serve immediately with white rice. This looks delicious! 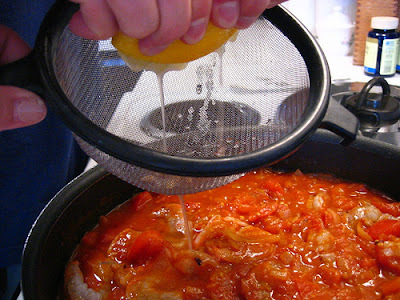 Had anyone tried with with canned tomatoes, a different meat, or a vegetarian version? I think I'm going to have to experiment while I wait for shrimp to go on sale! Canned tomatoes would certiainly be possible, as would a veggie version that could include tofu or perhaps chickpeas. You could also consider other types of seafood, including clams, scallops or other shellfish. Good luck and please report back what you experimented with and how it came out! This looks wonderful, Daniel, and thanks for sharing it. It's going into my rotation - not on a weekly basis, as shrimp is too expensive, but perhaps with fish fillets? I love its simplicity, the beauty of it on the plate, and on the palate. Carol, you are most welcome. Thanks for sharing your feedback. This is so delicious! We were raving about it. I added a few Tbs of harissa paste in addition to the tomato paste because I've been wanting to try it with something, it gave it a nice heat. I only had 1/2 lb of shrimp so I had to half the recipe, but I ended up keeping the full liquid (which I used bottled clam juice and water). Will for sure be making again. Thanks! Thank you CHEIS for sharing your thoughts and feedback! Really glad you liked it.